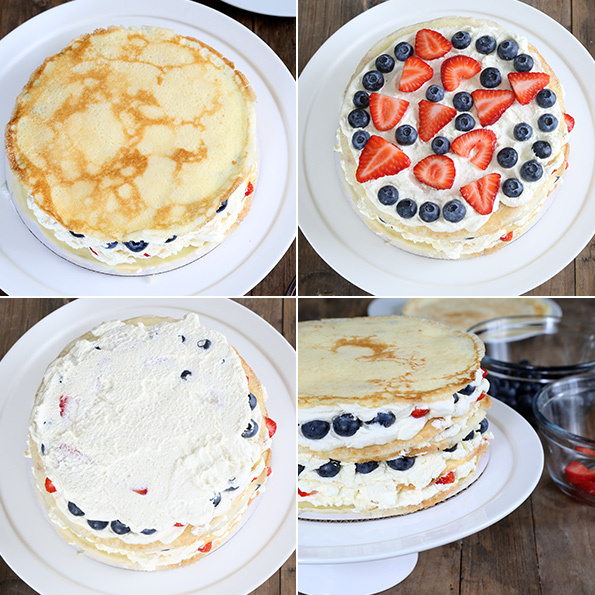 Easy Gluten Free Crepe Cake | Great gluten free recipes for every occasion. [pinit] Is it just me, or do crepes (gluten free or otherwise) not really get the props that they deserve? Maybe it’s because they have that Frenchie name and stuff, but really? There’s a pretty good argument to be made that they’re at least as easy to make as pancakes and, like, more versatile since you can roll things up in them … or layer them up into a delightfully easy no bake gluten free crepe cake. Like this one! Since the crepes we make aren’t If you like, you can even make the crepes ahead of time, wrap them well and keep them at room temperature for a day (or even 2!) before layering them into a cake. But the best part? It’s a make-ahead cake like this gluten free chocolate wafer icebox cake, and it needs to set up in the refrigerator so that it can be sliced properly. See how easy it is to assemble? Just layer a crepe with some whipped cream, followed by berries and more whipped cream, and another crepe. Keep going until you reach the tippy top. That’s it! I usually store it in the refrigerator just like that, and then put the final layer of whipped cream and a sprinkle of artfully placed berries just before serving. The result is kind of more impressive than the relatively small effort involved deserves. But isn’t that the best kind of summer dessert? 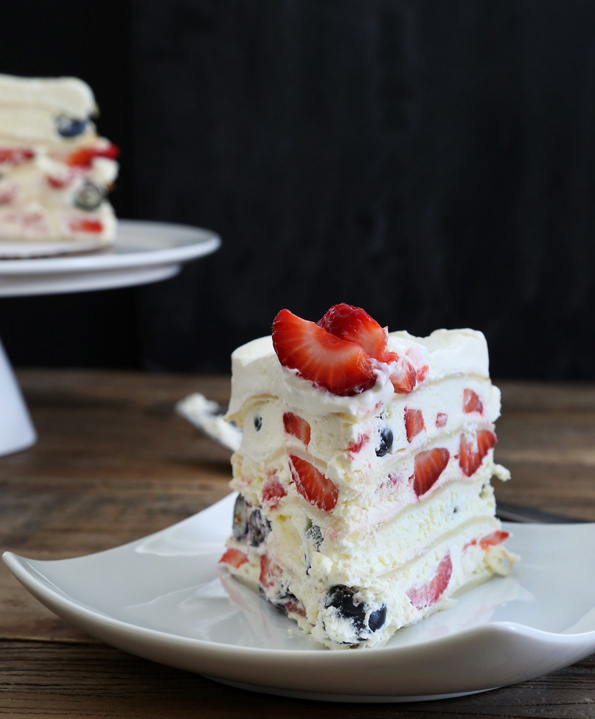 Celebrate the days of cheap, flavorful berries while they last with this easy no bake cake. Then sit back and enjoy these last weeks of summer break. First, make the crepe batter. In a large bowl, place the flour, salt and granulated sugar, and whisk to combine well. Add the eggs and butter, blending well after each addition. In a slow and steady stream, add the milk while whisking to combine. Continue to whisk the mixture until the batter is smooth. The batter should be thin and easily pourable. Continue to whisk until it begins to thicken. For best results, blend the mixture in a blender and process until smooth, then place the batter, covered, in the refrigerator to sit for about 30 minutes until chilled. It should thicken a bit as it chills. Make the crepes. Heat a 12-inch nonstick skillet over medium-high heat. Once the skillet is hot, hold the skillet just above the heat source and ladle 1/4 cup of batter into the pan. As soon as the batter hits the pan, swirl the pan to spread the batter evenly and thinly into a circle. Place the pan on the heat and allow to cook until the crepe is set but not crispy (1 to 2 minutes), and flip with a wide spatula. Allow the other side to cook for about another 30 seconds or until just set. Remove the crepe from the pan and cover with a moist tea towel. Repeat with the remaining batter and stack the crepes, covered. There should be about 8 crepes by the end, and you will likely only need 6 of them. Set them aside to cool. Make the filling and assemble the cake. In a large bowl with a handheld whisk or the bowl of your stand mixer fitted with the whisk attachment, place the chilled heavy cream. Beat the cream on medium speed until soft peaks form. Add the confectioners’ sugar, and continue to beat, increasing the speed to medium-high (but not to high), until stiff, shiny peaks form. Whipping the cream slowly yields a more stable whipped cream. To assemble the cake, on a cake plate (and/or on a 10-inch cardboard cake circle), place one of the cooled crepes. Cover with a thin layer of about 1/4-cup of the whipped cream, and top with a single layer of the strawberries and/or blueberries, pressing the berries gently into the whipped cream. 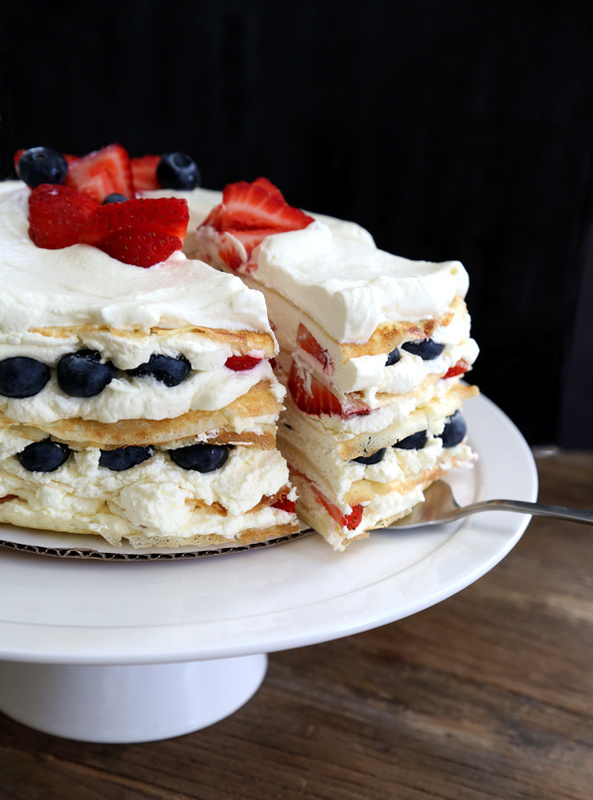 Top with another even layer of whipped cream to create an even single layer of filling. Cover with another crepe, follow with more whipped cream, another layer of berries followed by cream and another crepe. Continue layering until there is a total of 6 layers of crepes. 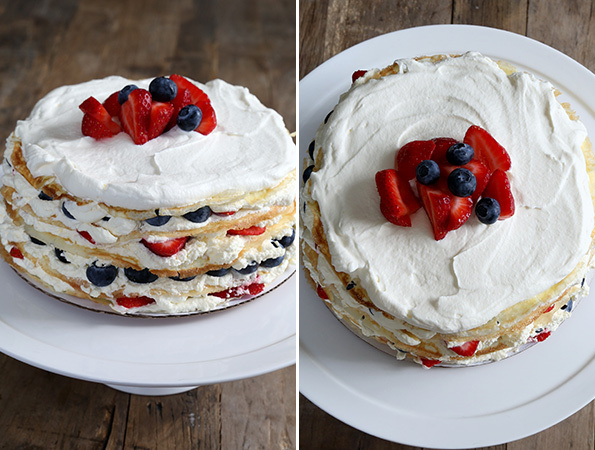 On top of the sixth crepe, spread a layer of whipped cream and scatter some of the remaining berries toward the center of the cake. Press them down gently to adhere. Place the cake in the refrigerator for at least 3 hours and up to overnight for the cake to set. Remove from the refrigerator, slice and serve chilled. Crepe recipe adapted from the Crepes on page 209 of Gluten Free on a Shoestring Bakes Bread. P.S. Which Gluten-Free on a Shoestring cookbooks do you have? Did you know there’s another one (cover coming soon!) coming out March 2015?! Pick up your copies of the first 3 today! This cake looks delicious & reminds me of how much I love crepes, both sweet & savory. I have 2 questions: a. Does the confectioner’s sugar stabilize the whipped cream enough so it doesn’t weep or collapse overnight? & b. How do you keep such a soft filling from squirting out the sides as you slice it? I’m wondering if placing it in the freezer for a half hour or so would help with the slicing or if there’s a particular knife you use? Hi, Rebecca, The whipped cream filling sets up in the refrigerator enough to slice it, just as you see in the photos. It’s not necessary to place it in the freezer at all. Any liquid that might come out of the whipped cream will be absorbed into the crepes as the cake sets up. That’s the way icebox cakes like this work. Don’t worry! Mmm It look so delicious ! Looks amazing! Could I substitute Unsweetened almond milk for the regular milk? I’m sure that would be fine, Christin, but that won’t work for the heavy whipping cream, I’m afraid. WE LOVE CREPES! I just introduced them to my kids this summer and they love them and they are pretty awesome. I put PB&J in ’em and send them in lunches even. Thank you for the blender tip because I was whipping pretty good and still had some lumps. I’ll throw them into the bullet and that should smooth it out nicely. It’s time I made these guys again! Also, I went to girl scout camp this weekend. They were super accommodating with my gluten free requests so it was pretty awesome! That’s a great idea, about the PB&J crepes in lunchboxes, Jennifer. I’ll have to try something like that! So glad girl scout camp worked out well. What a relief, right? !